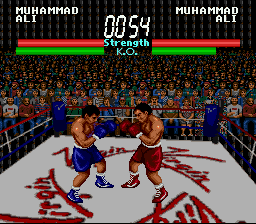 Muhammad Ali Boxing was an unreleased game by Virgin Games, developed by Park Place Productions. 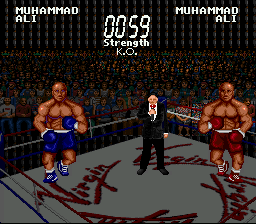 Muhammad Ali Boxing was intended for release on the SNES by Virgin Games. The first mention of Muhammad Ali Boxing was at the Summer CES in 1993. It is not clear why this game did not get released, but it perhaps was due to Virgin's focus on the Genesis version (which happened with Mick and Mac, also unreleased on the SNES). A prototype ROM image exists for this game. It is unknown what the source of it is. The prototype is a relatively early version of the game. The graphics are largely the same between the boxers (the head sprite is different in the boxer selection screen, but nothing is different during actual gameplay). The game seemed to feature an interesting rotating boxing ring. There are no sounds in the game, aside from an announcer at the title screen. The gameplay is not very polished, and computer opponent usually beats you within seconds. There are no visual clues as to what causes the TKO, aside from the TKO meter that is not necessarily depleted when you lose. I've included the ROM image here for archival purposes.